By Mateusz Mucha and Tomasz Jedynak - PhD. ROI calculator is a kind of investment calculator that enables you to estimate the profit or loss on your investment. Our return on investment calculator can also be used to compare the efficiency of a few investments. Thus, you will find the ROI formula helpful when you are going to make a financial decision. If you know how to calculate ROI, it's easier to foresee the results of an investment. What is a difference between ROE vs. ROI? How can you use ROI in making wise financial decisions? What are the advantages and disadvantages of ROI? And last but not least, in the text below, you will find out how to use our return on investment calculator to make your calculations (and thus financial decisions) even faster and smarter. First of all, you need to know that ROI is an abbreviation of Return of Investment. By definition, ROI is a ratio between the net gain and the net cost of an investment. In other words, ROI compares the net income from an investment to the net expenses required to finance that investment. Customarily ROI is presented in the form of percentage points. Thus, when a calculation returns a result of ROI = 0.1, the financial analysts report it as the ROI = 10%. Alongside other simple measures of profitability (NPV, IRR, payback period), ROI is one of the most frequently used methods of evaluating the economic consequences of an investment. Undoubtedly, its main advantage is its simplicity – ROI can be easily applied to measure investment profitability, as it is based on easily available data and its value is clear to understand and interpret. Moreover, as ROI is calculated as a percentage, it's easy to compare the results of many different investments. Consequently, you are able to choose the most beneficial one, all thanks to ROI. Before we move on and discuss ROI in greater detail, it is worth to mention that in finance, several different measures may be called return on investment. For example, you can say ROI when referring to Return on Invested Capital (ROIC), Average Rate of Return, Return on Equity or Earnings per Share. However, the best known and probably the most commonly used is a measure known as simple return of investment, henceforth referred to as return of investment (ROI). By the way, it is worth to mention that due to the terminology confusion, when you use ROI measure in the real-life decisions, it is a good idea to know precisely how it has been computed. We also believe that this is one more reason to read our article carefully from top to bottom. Investors can't estimate the efficiency of their investments without understanding how to calculate ROI. That's why the ROI formula plays a crucial role in investment decisions. Note here that the ROI equation doesn't take into consideration any risks associated with the investment. It is one of the biggest limitations of ROI (for more, see the section advantages and disadvantages of ROI). Do you want to understand the ROI equation? Are you curious about how to calculate the ROI in practice? Or maybe you want to know how to interpret the results of an ROI calculation? We have prepared a few examples to help you find answers to these questions. After studying them carefully, you shouldn't have any trouble with understanding the concept of ROI measure. You will also be capable of making smart financial decisions on the basis of ROI metrics. As an investor in the real estate market, you purchase a property in New York for $600,000. Three years later, you sell this property for $900,000. So the return on your investment for the property is 50%. As a marketing manager in a large international company, you introduce a new marketing program with a budget of $250,000. The result of this program is a $200,000 growth in profits over each of the following two years. First of all, note that your total gain from this investment is the gain from the first year plus the gain from the second year. So: G = $200,000 + $200,000 = $400,000. The ROI of the marketing program is 60%. You are an investor in a stock exchange. In January, you bought 150 shares of the company Alpha. The purchase price was $12.67 per share. Total value of the transaction was then: 150 x $12.67 = $1,900.50. After nine months, thanks to the favorable economic conditions, the stock price rose to $15.23, and you decided to sell them (value of the transaction was: $15.23 * 150 = $2,284.50. This time, the outcome of your investment is far from profitable. The numbers given in the examples in the previous paragraph are rather simple, the number used in real business investments tend to be a bit more complicated. If we deal with much larger amounts of money or with more complex numbers, it's far more comfortable to use our return on investment calculator. Although the ROI calculator bases its calculation on the same formula, the usage of it is much faster and easier. With our tool, it's enough only to type the invested amount and the returned amount to get your estimated ROI. Return on investment calculator is a tool for everyone who has got a business or is planning to set one up. This is also highly recommended for any investors, from shopkeepers to stockbrokers. returned amount – the total amount of money you are planning to receive (or you have already received) after the closing of the investment. That's it! In an instant, our return on investment calculator makes all necessary computations and gives the results. They are shown in a field ROI where you could see the value of ROI as a percentage. Did you know that you can also use the return on investment calculator the other way round? Plug in the initial principal (invested amount) and the percentage of estimated profit (ROI) to find out what amount of money you can expect to earn. In conclusion, our ROI calculator can help you make the most beneficial financial decision for you, completing many different cost-benefit analysis's in no time. 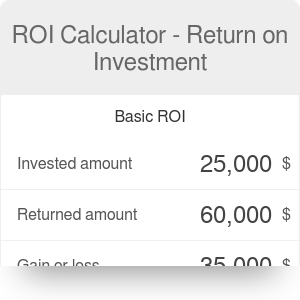 Moreover, with the mobile version of our return on investment calculator you are able to compute ROI whenever and wherever you want. Return on investment is a useful measure to estimate the surplus of net investment benefit on an accrual basis. ROI can also be used in making rational financial decisions. As a simple method, ROI is used primarily as an auxiliary at the initial stage of assessment of the investment project. Where LV is a predefined limit value. As return on investment (ROI) is sometimes confused with return on equity (ROE), it is worth briefly discussing the similarities and differences between them. Firstly, both ROI and ROE are simple methods of an absolute evaluation of investment profitability. The characteristic feature of ROI and ROE is that they are single-periods methods, and they do not have the same value for the entire duration of the investment. Moreover, neither ROI nor ROE takes the time value of money into account. In addition, both of these indicators do not include any risk measure. The main difference between ROI and ROE is that the former takes into account the total expenditure on investments (this is own capital and debt), whereas the formula of the latter includes only own capital. Obtaining the value of ROI does not require complicated calculations (especially with our ROI calculator). On the contrary, it is simple and easy. The results of calculations are easy to interpret and compare with other investments. The data necessary to perform calculations is easy to obtain. In fact, you only require two figures to obtain the ROI - gain from investment and cost of investment. The ROI formula does not take into consideration the changes in the value of money over time (formally, we say that the ROI disregards the factor of time). This leads to the conclusion that a higher value of ROI does not always mean the investment option is better than another. Let's consider two alternative investments with the same ROI of 20%. Investment A last one year, and investment B – four years. You will get the profit from investment A within one year. You need three additional years to get the same gain from investment B. Undoubtedly, despite the same values of ROI, investment A is better than B. To conclude: If you want to compare two investment options with ROI, you must make sure that ROI calculations are performed over the same time period. The determination of the LV (limit value) is not objective and thus may bias the result of analysis and lead to improper decisions. Return of investment may be susceptible to manipulation. It is because you can use different approaches to measure gain from investment and cost of investment. Results obtained from ROI calculations are valid and comparable only if the considered gains and costs are related to the undertaken investment, and are not effects of other causes. Return on investment is a very popular measure because of its simplicity and usefulness. Now that you know how to calculate ROI, it's high time you found other applications which will help you make the right choices when investing your money. We are sure that the ROI equation is not the only thing you should be familiar with to make smart financial decisions. If you are trying to decide what ROI you will get when investing time and money into building a software tool, check out the build vs. buy calculator. If you want to estimate the average yearly gain from your investment, you should use the CAGR calculator. If you are involved in a trade, you may also need the profit margin calculator, which lets you calculate every variable in the sales process. If you want to find your sale price or, inversely, the cost you bear, you should use markup calculator. If you need to assess the expected profitability of a planned investment project, try the NPV calculator. If you are trying to determine the rate of return on your real estate property purchase, you should check out the cap rate calculator. And last but not least, if you want to know how long you have to save to make your dream comes true, use our dream come true calculator. Mateusz Mucha and Tomasz Jedynak - PhD. ROI Calculator - Return on Investment can be embedded on your website to enrich the content you wrote and make it easier for your visitors to understand your message.